This is a disease of the liver in which normal liver cells are replaced by scar tissue. This affects the normal flow of blood through the liver, and so reduces its ability to function normally in tasks such as removing toxins from the blood. Once cirrhosis has occurred it is irreversible, even if the underlying cause is removed but treatment can slow down or stop any progression of the cirrhosis. 1. Viral hepatitis. There are several different types of virus, causing different types of hepatitis. Hepatitis A and E do not appear to cause cirrhosis, but Hepatitis B can cause it in a small number of affected people if it is present for over six months - the period after which it is called chronic hepatitis. Hepatitis C causes cirrhosis the most frequently of these viral infections since it becomes chronic in a high percentage of them. 2. Excessive alcohol intake. 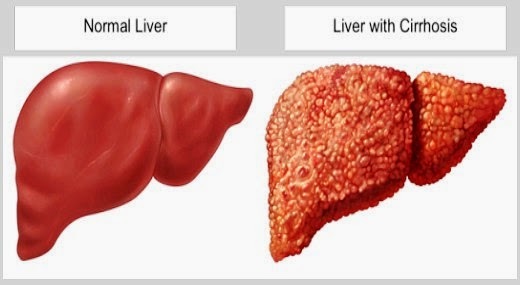 In general, of those people who drink too much about a third develop fat around their liver as a direct consequence of this, and about 10% of the rest develop cirrhosis. The greater the alcohol consumption, the more likely that cirrhosis will develop. 3. 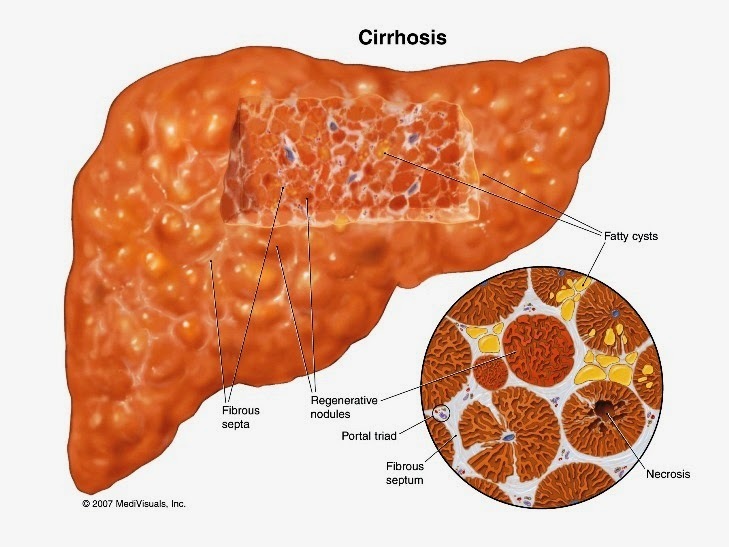 Diseases of the bile system, such as primary biliary cirrhosis - a liver disease caused by an abnormality of the immune system, found mainly in women. 4. Autoimmune hepatitis is also found more commonly in women, and is of unknown cause. Its effects are to direct the body's own immune system against the liver, causing inflammation and cirrhosis. 5. Some inherited disorders cause the accumulation of toxic substances in the liver and subsequently cirrhosis. Examples of these include the abnormal accumulation of iron (haemochromatosis) or copper (Wilson's disease). • Vomiting blood, due to burst veins at the bottom of the gullet caused by backpressure on them from the liver. Many patients however have few or no symptoms, and their cirrhosis is picked up in the course of routine investigations for unrelated conditions. Will I Have Tests Or Investigations? After taking a detailed history and physical examination, your doctor will arrange for some specialised blood tests that will assess how well your liver is working. These are known as liver function tests and will be taken as part of a general blood screen for hepatitis and other infections or possible causes of cirrhosis. This is usually followed by a liver ultrasound, where sound waves painlessly build up an image of the liver on a TV screen (this is the same test that pregnant women have to check their baby), and sometimes a liver biopsy where a small sample of liver tissue is taken for examination under a microscope by a pathologist. Once scarring of the liver has occurred, it is permanent. This means that treatment is designed to limit any further damage to the liver as well as any complications. Alcohol and drug avoidance, coupled with a sensible diet and supplemental vitamins often helps. With Hepatitis B and C, anti-viral treatment can sometimes help in the early stages such as Interferon, and if an autoimmune hepatitis is the cause then medications that suppress immunity such as Azathioprine can be given. Fluid retention and ascites can be managed with fluid restriction and diuretics ('water tablets'), and bleeding from the veins into the gullet can be treated by injecting a chemical sclerosing agent into them that scars them shut. What Course Will This Illness Follow? This depends on the cause but the majority of people with cirrhosis simply need regular checks of their liver, often under specialist out-patient care, and treating if their cirrhosis worsens. If cirrhosis is far advanced, liver transplantation may be considered and the current statistics show that over 80% of liver transplant patients are alive 5 years after operation with most of them able to lead active lives in full employment. It is important to take any medication as prescribed, and not to drink any alcohol if your doctor has advised against it. Leading as healthy a lifestyle as possible is always advised with cirrhosis, as the less toxins your liver has to deal with the better. 1. Have you ever noticed if you have gone a yellow colour? 3. Are you losing weight? 4. Does your abdomen seem to be swelling up? 5. Are there any liver problems in other family members? 1. Will I need to stop drinking for life? 2. How advanced or otherwise is my cirrhosis? 3. What are the side effects of any medication I need to take? 4. Does a liver biopsy hurt? 5. If I have hepatitis, am I infectious?